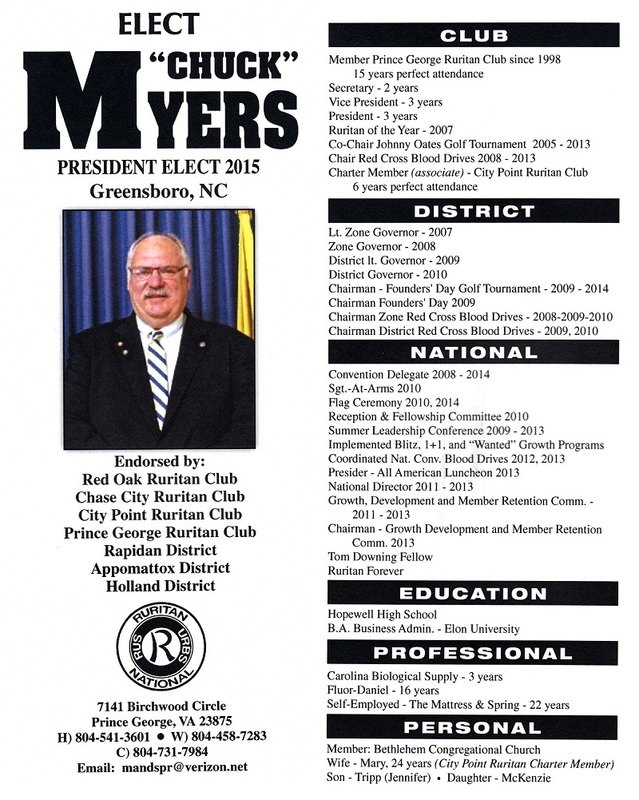 The Rapidan District Cabinet voted to endorse Chuck Myers candidacy for Ruritan National’s office of 2015 President Elect at the July 30, 2014 Cabinet meeting held at the Inwood Restaurant in Gordonsville, VA.
Chuck, a dedicated and long-time member of the Prince George Ruritan Club believes that Ruritan is the best community service organization in America. Chuck has received encouragement from Ruritan leaders and the support of his wife Mary and their family to run for President Elect. Self-employed, Chuck has the time that serving Ruritan as the 2015 President Elect, then the 2016 President, needs, deserves, and demands. As President Elect, Chuck will put special emphasis on Membership, Youth, and Communication. The Membership efforts will focus on recruiting, mentoring, and retaining members. The Youth efforts will focus on helping our clubs to take a more pro-active look at recruiting, mentoring, and retaining youth members. Chuck believes that youth are the future of Ruritan. By recruiting more youth into involvement and membership our local clubs, we will be able to continue benefiting our local communities while preserving the future of Ruritan. Communication improvements will help disperse information between Ruritan National, local clubs and individual members. Implementing a more dynamic Ruritan National Internet presence can provide that vital connection. This entry was posted in Community Service, From the desk of the Lt Governor, Goodwill, Ideas to ponder, Local Ruritan Clubs, Membership, Publicity, Rapidan District Cabinet, Ruritan, Ruritan National, Social Media, Youth and tagged America, Chuck Myers, Communication, community service, Community Service Club, information, Internet, Inwood Restaurant, Local Ruritan Clubs, membership, mentoring, President, President Elect, Rapidan District Cabinet, Rapidan District Cabinet Meeting, recruiting, retaining, Ruritan National, youth. Bookmark the permalink. ← Eight Month Anniversary of the Rapidan District Going Online!